Welcome to the Allegheny River & Watershed Clean-up website! Since 2008, more than 3000 volunteers have donated almost 24,000 hours and have removed almost 475 cubic yards of trash from the watershed. They have pulled out television sets; microwave ovens; lawn chairs; refrigerators; 55-gallon drums; more than 1,650 tires and have filled many bags of recyclable metal, glass, plastic and aluminum. We're gonna do it again and you can be part of it! Deadline to sign up to volunteer is Friday, April 28th. 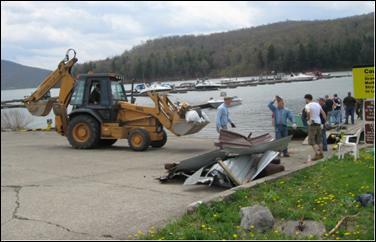 The 2019 (15th Annual) Allegheny Reservoir Clean-up will take place on Saturday, May 11, 2019. We'll meet at the Onoville Marina (same as last year) at 8 a.m. where everyone will sign-in and be given supplies (trash bags and gloves) prior to being taken to a designated spot on the reservoir. If you're interested in participating in one of Warren's "extreme cleaning events" first visit the FAQ page, and then head over to the Volunteer page to sign up! Well, 2018 was not a banner year for either the Allegheny Reservoir Clean-up or the Allegheny River Clean-up! 'Ideal' water levels for the Allegheny River Cleanup are approximately 2,500 cubic feet / second (cfs) flowing out from Kinzua Dam. Unfortunately, with hurricane Florence bearing down on the east coast, our friends at the US Army Corps of Engineers were not able to accommodate that this year. As a result, we were not be able to put volunteers out in canoes on the final two days of the cleanup but we still managed to make some very significant progress on making it a healthier, safer and more enjoyable watershed. Having said that, about 150 volunteers did manage to collect more than 22,000lbs of recyclable metal (easily a River Cleanup record), 29 tires and 15 cubic yards of garbage. It's the 10th year of the Allegheny River Clean-up and we're still going strong! Last year (2017) we saw a total of 317 volunteers donate roughly 2,536 hours of their time while removing 5,350 lbs. 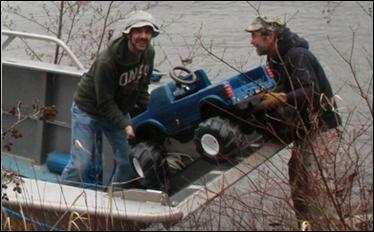 of metal, 94 tires, and 35 cubic feet of trash from Allegheny and the Conewango Creek. (Note: The volume of trash and metal collected in 2017 year was lower than usual with high water on the first Saturday, Monday, and Friday). This brought our recycled metal totals to more than 93,849 lbs, garbage to 421 cubic feet and the tire total to more than 1,428 over 9 years. We're gonna do it again and you can be part of it! The 10th Annual Allegheny River Clean-up will take place on five days between Saturday, September 8th and Saturday, September 15th. For information about the Conewango Creek clean-up event planned for Saturday, Sept 8th, contact the Conewango Creek Watershed Association. Monday, September 10th will be a new type of clean-up adventure for us. Monday will be a targeted action day - No canoes on Monday! We will be targeting several large, historic dump sites. Volunteers will meet at Larimer Park in Russell at 8:30 am for sign in and a safety briefing. Then DRIVE to their designated clean-up areas. Bring gloves and digging tools. Tuesday, Friday and Saturday we'll be on the Allegheny River - in canoes and kayaks. Register as soon as possible - it really helps with the planning! If you're interested in participating in one of Warren's "extreme cleaning events" first visit the FAQ page, and then head over to the Volunteer page to sign up! The 2018 (14th Annual) Allegheny Reservoir Clean-up took place on Saturday, May 12, 2018. 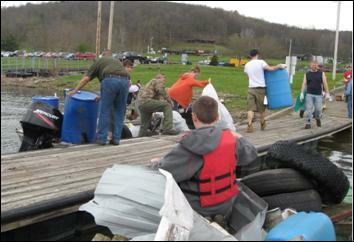 Thank you to everyone who contributed to a very memorable 14th Annual ALLEGHENY RESERVOIR CLEANUP. To say it rained a little may be an understatement! The rain was amazing, thunder was awesome and the lightning was a thing to behold! In total, 78 volunteers and employees collected more than 8 cubic yards of trash and 20 tires. The thirteenth annual Allegheny Reservoir clean-up took place on Saturday, May 13th 2017, and was a huge success! This was the fourth year that the Reservoir clean-up crossed north into New York State and it became quickly apparent that our efforts are really beginning to show. Thank you to everyone who contributed to this year's effort. Despite the weather, 92 volunteers and employees spent a beautiful Saturday collecting more than 50 cubic yards of trash and 352 tires. The annual clean-up continues to be a cooperative effort involving the US Forest Service (USFS), US Army Corps of Engineers, Warren County Adult Probation and Parole, and numerous other agencies, organizations, and businesses. Again, this year the group was joined by Seneca Nation of Indians and Cattaraugus County's Onoville Marina, who served as hosts for this year's activities and played key roles in making this year's event the smashing success that it was. Now in its thirteenth year, the positive effects of the annual Reservoir clean-up are very apparent. As a result of this annual "community conservation event" the shorelines and waters of the Allegheny Reservoir are much safer and cleaner places for the wildlife and recreationalists who use them. The 8th Annual Conewango Creek and Allegheny River clean-up was a huge success! The Conewango Creek and Allegheny River clean-up team (as well as the community), want to extend a heart-felt thanks you to all of those folks that helped to make this event so successful. This year we spent two days on the Conewango Creek (2015 Pennsylvania River of the Year) and three days on the Allegheny. After seven years, our work is very evident! Regular volunteers commented on how much better the river and creek look. Nonetheless, this year, in just five days, 336 volunteers donated about 2900 hours to remove more than 40 cubic yards of garbage, 92 tires and wheels and almost 12,000 pounds of metal. We were fortunate to have ideal weather this year, and although the work is hard, it's also fun. Ever wonder what it might look like? Take a look!! Watch for information about 2017!! !